One of the very important things I don't noticed being emphasized very often from doctos or diabetes educators, is the very clear fct that the more ups and downs you see in your blood sugar, the more ilkely you are to gain weight. There are a lot of physiological reasons for this, and I'll go into them a bit here...but the most important part of understanding this fact is that it just might add a little motivation to your efforts to keep that blood sugar in range. You see, even if you're running and working out, if your blood sugar is sky high during or around your workout, you won't be using fat for fuel. You'll be burning calories, sure, but when all of that sugar is just sitting in your bloodstream, your body can't properly burn up body fat. We need insulin to help carry that sugar to wherever it needs to go. Now, aside from a workout situation, if your blood sugar is 240 mg/dL and you give yourself 2 units (for example) of insulin to bring it down to 120 mg/dL, that sugar that is absorbed by those 2 units of insulin will be stored as fat. 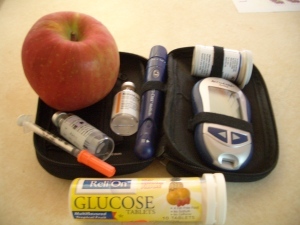 I am writing a book that explains the other ways carbohydrates and sugar are used in our body, but in this particular situation, the sugar from a high blood glucose reading will be converted to fat and stored on your body when there is finally enough insulin available. So let's imagine that you have two to three high blood glucose readings at least every other day for three weeks straight...that is a lot of sugar being stored immediately as fat! And the vicious cycle that often occurs after we try to correct a high, is that we drop low. More food you didn't really need, more calories, more weight gain. Fine-tuning your correction factor dose and really taking the time to do the calculations when you're correcting a high bloog glucose reading can help prevent that cycle. (In my book, as well, is a process to help you really fine-tune correction factors for all different situations). Lastly, on weight gain and high blood sugar...in order to really LOSE WEIGHT, your blood sugars need to be under great control, because as you can see, a few high blood sugars on a regular basis put a stop to that fat-burning process. In my own efforts to lose weight, I actually got slowed down in the process last week because while I was traveling in Orlando and eating July 4th food that isn't part of my usual diet, my blood sugars were much higher than usual, and I didn't lose weight...in fact I think I gained a pound because of it! In the end, (I use that phrase too much...), there are many, many reasons to aim for good blood sugars. Yes, one of them is to get that great A1C reading, but if you're aiming to lose weight, you can't put diabetes on the back burner, good control has to be part of your plan.